I mentioned in my About me page how my passion for honey started. 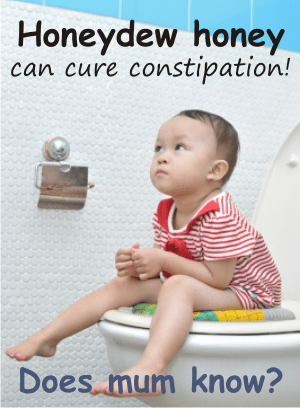 Before I solved my son’s problem, I often wondered what cures constipation, tried different methods suited for a three years old, but nothing happened. And then I discovered honeydew, (it was from fir tree that one) and without even knowing, it helped my son’s problem. Honeydew honey is different than blossom honeys. It is honey made in the woods, meaning that the working bees gathered dew from the trees, and not pollen from flowers. Read more about the way this honey is made here, in the page: Types of honey. 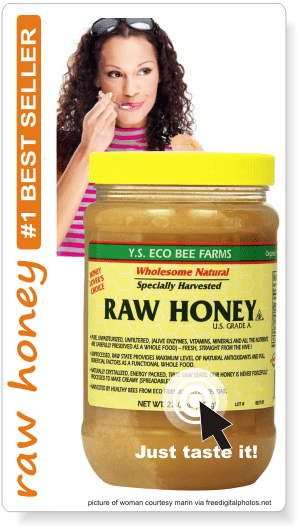 further reading: What is honeydew honey? 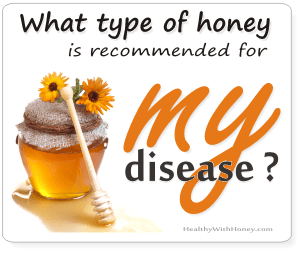 How does honey cure bowel disorders? A good function in the bowel is maintained by our good bacteria, known as probiotics. Our tenants from the bowel help us with our digestion and immunity system. Probiotics exist and increase their number if they can find the food they like, among what we ingest, a food called prebiotics. We are taught that prebiotics are found in whole cereals and vegetables, generally in fibers. 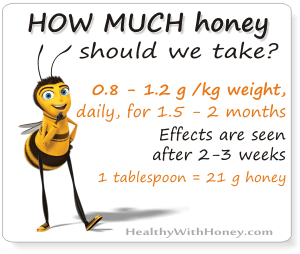 Honey contains oligosaccharides. These are complex sugars that are believed to contribute to the anti-diabetic effect of honey (you may also be interested in Can diabetics eat honey?) as well as produce beneficial effects on lipid (fat) levels. These oligosaccharides are not digested in the upper gastrointestinal tract as it happens to the simple sugars found in honey, but make their way into the large intestine where they serve as prebiotics for microorganisms (probiotics or good bacteria) found in the gut. This is how scientists explain the positive effect of consuming honey on conditions like obesity, insulin resistance and diabetes, as well as reduction of lipids (triglycerides and cholesterol). Simple sugars such as sucrose, glucose, and HFCS contain no complex sugars and have no similar prebiotic effects. (according to Ron Fessenden in The New Honey Revolution). BUT, if you suffer from constipation as a symptom of what it is called Irritable Bowel Syndrom (IBS), or irritable bowel disease, it is indicated not to eat honey, at least not much, and definitely not when you are in the acute stages of the disease. 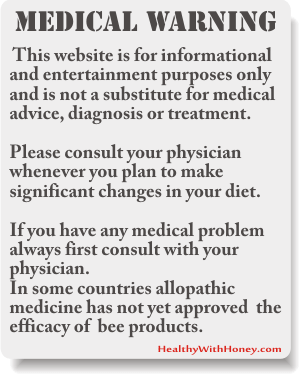 Please read Can I have honey in IBS?, and completely avoid manuka honey. Are all honeys good for constipation? 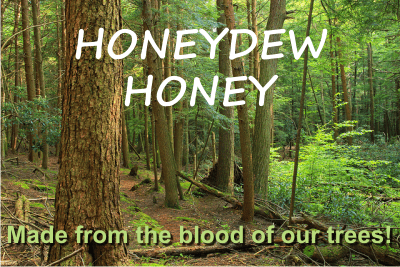 – honeydew (theoretically at least, honeydew honeys have more oligosaccharides and should have a stronger prebiotic effect than blossom honeys) – sourwood, alfalfa, coriander, sage and clover (but not red clover which does the opposite) and sidr honeys have been researched and proved to have prebiotic effect. Chestnut honey was found to have a prebiotic effect higher than accacia honey. There is need for more research of unifloral honeys to determine their prebiotic effect. So, if you can’t find one of the above honeys, it’s best to use a polifloral one. Also instead of honey, one can use fresh frozen pollen or even better, beebread. Coming from the sources mentioned above. It does, but only if it’s a fresh one, about 2-3 months old. It contains Bifidus and Lactobacilus bacteria. These are good probiotics that help our body have a balanced digestion and a strong immune system. They are nowadays recommended by doctors every time we take antibiotics, or catch a cold. So, instead of tablets, why not enjoying a spoon of honeydew? Remember that in the first 2-3 months honey has probiotics and prebiotics, and then it has only prebiotics that feed the existing probiotics in our bowels. So, during summertime, try to find some from your locals. If you cannot find at your locals (this should always be your first choice), then you can still find fresh honey at bio online shops, or even on Amazon. Check for the manufacturing date. Here is an example of honeydew honey produced in New Zealand, It’s raw, meaning not heated, full of enzymes and prebiotics, perfect to make a tummy really happy. Give it a try! Click on the picture. Fir tree honey is what I have tried first and worked wonders. Because it comes from the fir trees, also leads to amazing benefits on any king of respiratory problems. Spruce honey is also recommended. – Whole grains (again, for their probiotics and prebiotics components) Especially barley. Try to eat at least six ounces of grain products a day. – Plenty of fruits and vegetables – they contain a high percentage of water in addition to their fiber content. Eat only overripe bananas. – More water. More than two liters of water every day. – Flaxseed oil. It does work! Try it in capsules, to take oil by the spoon is really hard. Two capsules a day should do the job. They are also recommended for pregnant woman. The flax seeds contain Omega 3 – 6 – 9 in the perfect ratio needed by our body. They help regulate your digestive system and boost your metabolism. Olive oil is also very good. Just increase the amount of oil in your diet, and make sure the oil is not heated. – Exercise. If you don’t move much, neither is your digestive tract. – Do regular checks for germs, bacteria and fungi in the intestinal tract. There are also some worms that cannot be detected by regular tests, but they can be there. I personally used, and therefore recommend, a therapy based on an old treatment, used some time ago and then banned (probably due to the development of our pharmaceutical companies): colloidal silver. Two years ago, when I was checking my son for this kind of bacteria, I decided to check myself too, and this is how I discovered I had Salmonella! I had no particular symptoms, other than the discomfort associated to an irritable bowel syndrome (that I thought to had). I took 15 ppm colloidal silver from a trustful source, like 60 ml per day for two weeks. After the first doze, in a few hours I had a major cleaning of my bowels (really major). The vendor said it was a natural thing: too many bacteria died and the body expelled them all at once. It’s called the Herxhmeier effect. So, I took Colloidal Silver because it has a broad spectrum, for all possible bad bacteria and the next medical check turned negative. Yuppyyy! I have recently found a new site about this, you may want to check: colloidalsilverfacts.com/ There is a lot of info out there waiting to be read and understood. It’s up to us now. – Clear energetic background. Though it may sound mystically and loony, I believe our physical bodies work on an energetic platform, just like an admin dashboard is to a site. And that 80% of our body’ s functionality is given by this energetic/spiritual “body”. I think everybody knows about it, but never remember to heal this one first, as it is the power source for the physical one. At this point I follow a Russian therapist, Lazarev (see Diagnostics of karma: The First Book. The Field System of Self-regulation) , who says we first have to solve our karmic issues from this life, past lives and energy coming from people around us and then our body can be healed. A child is like an extension of his mother, so if you want to heal a child, first heal the mother. – First, our impossibility to digest/accept some things (opinions, actions of others etc) in our lives, and our digestive system does exactly what we are doing on an emotional level. And don’t blame your diet for it. Don’t get exaggerated. Here are some thoughts on this subject: Eating healthy is useless. How can we be healthy and happy? And here is a good one, yet useful: Do you how your poop should look like when it’s healthy? 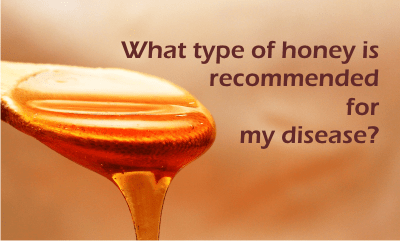 Hello laura, can clover honey treat acid reflux symptoms?Please let me know which type of honey that suitable for acid reflux .thank you so much. For GERD manuka honey is more recommended. 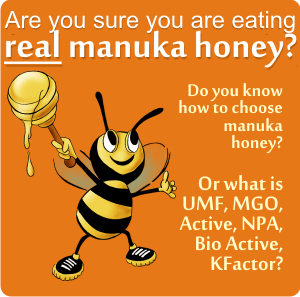 Take 3 full spoons per day of manuka honey UMF 15+, before meals and before bed time. Take it on a piece of bread, a fruit or with tea to avoid being dissolved too fast into the blood stream before it gets into the stomach and starts affecting the stomach lining. If eaten alone it can even aggravate the symptoms. NEVER give honey to a child under 1 year of age! I did mention that, in the article When can kids have honey?